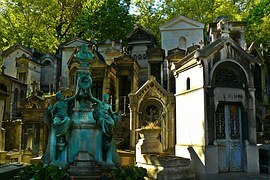 Ever Been on a Parisienne Graveyard Tour? Why Not? I'm a huge fan of so called 'dark tourism' sights and, having visited Paris a number of times in the past, I was left wondering what else it could offer me. After realising that my elder sibling wanted to visit (for the 13th time) to celebrate her recent birthday, I figured that it would only be fair of me to share my passion for all things dark and depressing with my two favourite sisters. They were not at all as horrified as I expected, which was nice. Once I started to do some research, I quickly realised that the hotels and apartments of Paris have witnessed the demise of many a famous name and I felt that, in their honour, we should really check them out. This is the all new guide to celebrity death sites in Paris. It's less horrendous than it sounds... honestly. When I mentioned this to my sister, she didn't even know that the Addicted to Love singer had died, never mind expired in her favourite city. I seem to vaguely recall being shocked when his death was reported because it was so unexpected and he was a relatively young man. Palmer was staying at the Warwick Hotel on 5, Rue de Berri, just off the Champs Elysees when he died of a sudden heart attack on Sept 26th, 2003. After spotting the nightly price list, I wondered whether this might have been the catalyst for the attack, but we'll probably never know. The iconic singer and actress was born in Germany and later moved to the US, becoming a citizen of the country in 1939. Dietrich became one of the highest paid movie stars of her time and enjoyed massive success around the world. She enjoyed a long and varied career until falling off stage in September 1975 and this pretty much ended her career. She did go on to sign the title track in the movie 'Just a Gigolo', in 1979 but, by then was addicted to painkillers and alcohol, which she had become dependent on during a bout of cervical cancer in 1965. Dietrich spent the final decade of her life at her apartment in Paris at 12 Avenue Montaigne, which is located in the 8th arrondissement, just off the Champs Elysees. She rarely admitted anyone to visit her and was largely bedridden during this time. She eventually passed away on 6th May 1992. I can't think of anyone who doesn't already know that Diana was tragically killed in a high-speed car accident in central Paris in August 1997. I recall it very clearly and remember waking up the morning it was reported and realising that no radio or TV was being broadcast across the majority of the UK as a tribute. It was a very strange day. There are obviously so many conspiracy theories and other odd stories that have surrounded her death and that of her partner, Dodi al Fayed, but nothing has ever come of these. On the evening of 31st August 2007, Diana and Dodi left the Ritz Hotel in Paris and were driven by a drunken Henri Paul, towards the Pont D'Alma Tunnel, which runs beneath The Seine. It was initially reported that they were being chased by photographers and this is the explanation for the speed their car was travelling when it slammed into the underground passage beneath the road. Afterwards, it was confirmed that there was, in fact, no paparazzi in pursuit of the car. Diana was transferred to a local hospital where she was later pronounced dead. 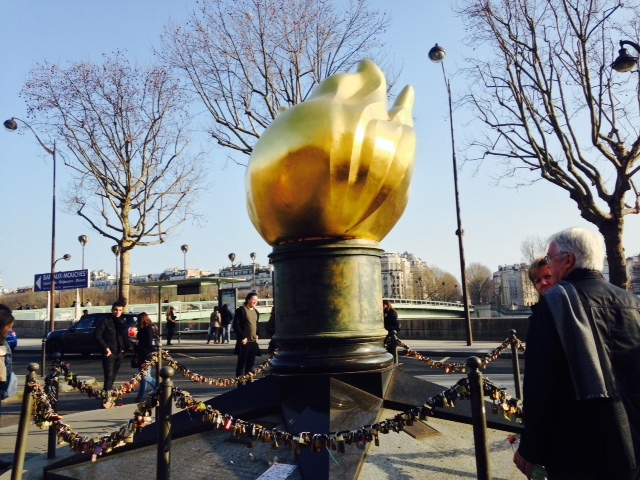 At the Pont de L'alma Bridge, there is a life-sized replica of the Statue of Liberty flame that was gifted to the US from France. On this memorial, there is a photo of Diana and people often leave flowers there on her birthday or to commemorate the anniversary of her death. Pont de L'alma Bridge is across the street from Alma Marceau metro station and is located in the 8th arrondissement. If you're in a very dark mood, you can also check out the Pitié Salpêtrière Hospital, 47-83 Boulevard L'Hopital in the 13th arrondissement, which is where the Princess of Wales was declared dead. Doors' front man, Jim Morrison, moved to Paris to be with his long-term partner, Pamela Courson in March of 1971. Morrison was as much famed for his leather trousers and singing as for his obvious substance abuse addiction. I personally remember him fondly for his voice and the fact that he adorned the walls of my teenage bedroom for years. The couple rented an apartment in the Le Marais district of the 4th arrondissement at 17-19 Rue Beautreillis. It is here, in the bath, that Morrison died of an accidental heroin overdose on 3rd July 1971. 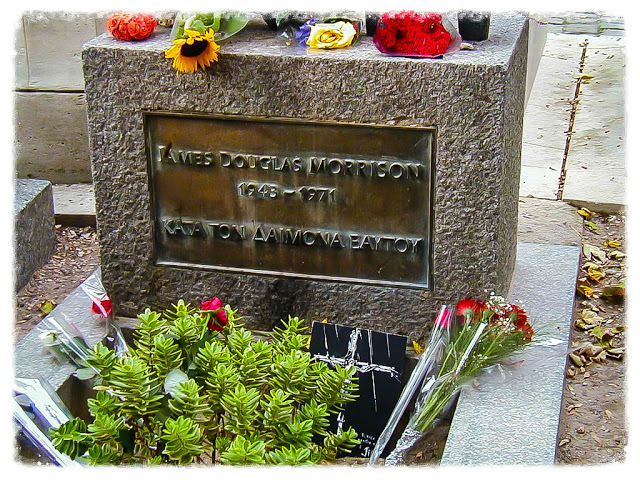 Morrison's body is buried in the famous Pere La Chaise Cemetery on the outskirts of the city, alongside the likes of Oscar Wilde and Edith Piaf. It's a fairly small, innocuous grave, but can be easily spotted by the flowers and guards that often surround it. 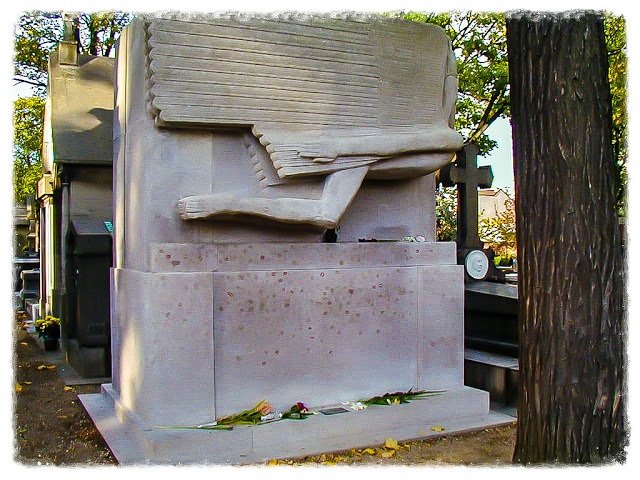 The legendary Irish poet and author, like Jim Morrison, spends his resting days in Pere La Chaise. 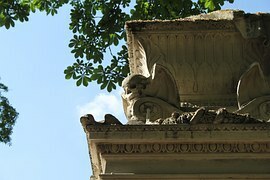 His tomb, however, is pretty fabulous and is adorned with different coloured lipstick kisses on a massive angel type structure. It's quite the sight. Wilde spent his last years in Paris after being released from jail in the UK after his sentence for gross indecency stemming from his homosexuality and the inability of the government and people of the time to have any kind of understanding of his sexual preference. He never returned to Britain or Ireland after prison and who can blame him. Wilde spent time in Northern France before relocating the less than salubrious Hotel D'Alsace at 13 Rue Des Beaux Arts in Paris. It was here that he passed away from cerebral meningitis on November 30th of 1900. The famous haute couture designer probably isn't much of a surprise to find on this list, what with her being French and all. She was born Gabrielle Bonheur Chanel in Samhaur in France and was the Queen of Parisian fashion for decades, founding the brand which held her name. Chanel lived in The Ritz Hotel on Place Vendome in the 1st arrondissement for almost 30 years, which seems like a pretty good place to spend time, if I'm honest. At the grand age of 87, after taking a drive, Chanel retired to her room at the hotel and quietly passed away on January 10th 1971. As previously stated, the Ritz Hotel was also where Diana departed from on the night of her death, so it's clearly the place to be. Or not. As with Chanel, the knowledge that YSL passed away in Paris is hardly likely to come as a massive shock to...well, anyone, really. Born in Algeria in 1936, YSL headed off to the French capital at the tender age of 17 and enrolled himself in fashion school. He won first prize in a competition aimed at attracting young, up and coming designers, which gained him recognition. By the time he was 21, he was head designer at Dior, which is an incredible achievement for someone of any age, never mind someone who has barely scraped into their twenties. Saint Laurent went on to achieve global recognition before eventual retiring in 2002. On June 1st 2008, he died of brain cancer at his apartment at 55 Rue De Babylone, just a few days after he and his long term partner were joined in a civil union. Rue De Babylone is located in the 7th arrondissement, just a short walk from Sevres Metro station. 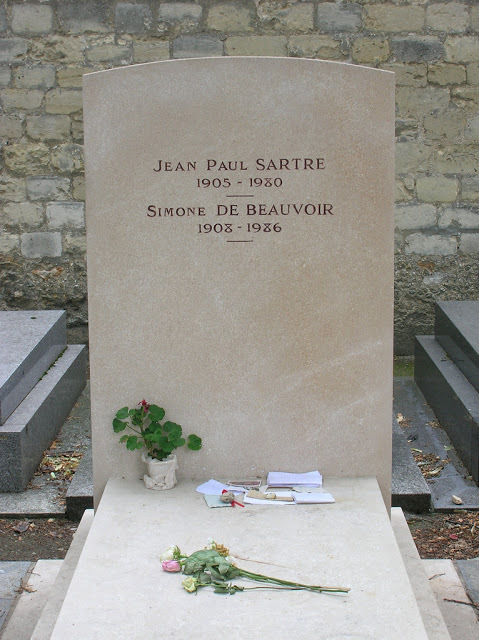 Satre who, like me, you've probably heard of, but know the grand total of nothing about, is a French playwright, novelist and philosopher. His partner, Simone de Beauvoir was a French writer and prominent feminist. Talk about power couples, huh? Unfortunately, for all their intelligence and astute questioning of society's perceptions, they both had a bit of a thing for young females and were known to campaign for the abolishment of the age of consent in France. de Beaviour was stripped of her teaching licence in her country for having relationships with underage students, which she would then pass over to Satre. It is mainly for this, and various other jaw-dropping personal undertakings, that I then question their interment to Montparnasse Cemetery in the city. However, I do recognise their talent but I was entirely uncomfortable paying their side by side graves a visit, knowing all that other stuff about them. But, that's maybe just me. Jim Morrison was hardly a saint, but I had no problems at all popping over to say hello to him. 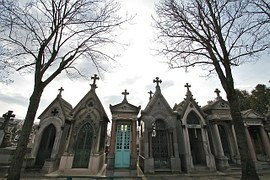 If you want to visit the dynamic duo, you can do so in the south of the city and can access the massive graveyards from Boulevard Edgar Quinet or Rue Emile Richard within the Montparnasse region of the 14th arrondissement. The cemetery is the final resting place of a host of French artistic and literary talents, so there's plenty more to see within the walls. JPS was laid to rest in 1980, with SdB following him in 1986. Paris is the location of the oldest pet cemetery on earth. ON EARTH, people! These are clearly people who love their pets and, as far as I'm concerned, that makes them a mighty fine bunch. The Cemetery of Dogs and Other Domestic Animals or Le Cimetiere des Chines et Autres Animaux Domestiques, to give it its proper title, is located on the outskirts of the city at 4 Pont de Clichy. The graveyard was founded by a change in French law which was put into place to combat the French tradition of burying their pets wherever they liked (literally) or simply dumping them in the Seine or their grey recycling bin. I'm not even kidding. I would now like to retract the earlier statement I made about the French being a mighty fine bunch for loving their pets. What kind of nutter puts their dead dog in the trash? Anyway, the point of this wasn't to berate the French for their dead animal disposing techniques, but rather to tell you that one of the most famous canines on the planet has his four legs and tail buried within the cemetery. Rin Tin Tin was a French pooch, adopted by an American soldier during World War 1 and taken back to the US, where he found fame as an actor. No, really. Rin (I'm assuming that was his first name) died in 1932 in the States and was repatriated to his home nation to be buried. He was clearly a very, very good boy.